Advising and recommending to the University President on making necessary changes and taking actions in order to sustain strong academic programs and institutional success. Overseeing the different academic operational strategies and tasks within the different colleges to ensure constant improvement of the different academic programs and to identifying potential opportunities to maintain the academic growth of the University . Promoting the University uniqueness in order to maintain a sound competitive edge nationally, regionally and internationally. Assuring the delivery of an outstanding array of programs that guarantee academic integrity in accordance with the University’s goals, mission and vision. The VPAA is the academic catalyst to stimulate and assure the excellent academic level of the University and to provide a connection between higher administrations and the different Colleges within the University. Minimum requirements for this position include a Doctorate or terminal degree with sufficient academic credentials to stimulate building the University. 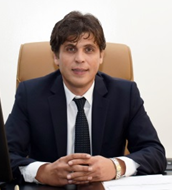 Dr. Sameer Al Barghouthi is the founding Vice President of Academic Affairs and an Associate Professor in Accounting and Finance at Al Falah University in Dubai, United Arab Emirates. Throughout his distinguished career, Dr. Al Barghouthi has held a series of faculty and administrative positions, such as the Vice Dean of the College of Business Administration and Head of Department in reputable universities in the Arab region. Due to Dr. Al Barghouthi’s unwavering dedication to academic excellence and his knowledge of the existing and emerging issues in higher education, AFU was able to establish and maintain a reputation as a thriving university at a regional and national level. Under his leadership, AFU developed high-level educational and research academic programs that prepare students for the current and future roles demanded by society and the professional communities whilst shaping the learning experience to match the students’ interests and aspirations. Dr. Al Barghouthi earned his doctoral degree in Accounting and Finance from Manchester Metropolitan University, United Kingdom in 2005. His Masters in Accounting and Finance was awarded by the Arab Academic for Banking and Financial Sciences. Dr. Al Barghouthi’s experience as a researcher and scholar has resulted in published articles in various academic journals such as International Business Research, European Journal of Business and Management, and International Research Journal of Finance and Economics. It has also resulted in invitations to present and to deliver keynotes in top national and international conferences. His research interests are in the areas of stock market behavior and market efficiency.